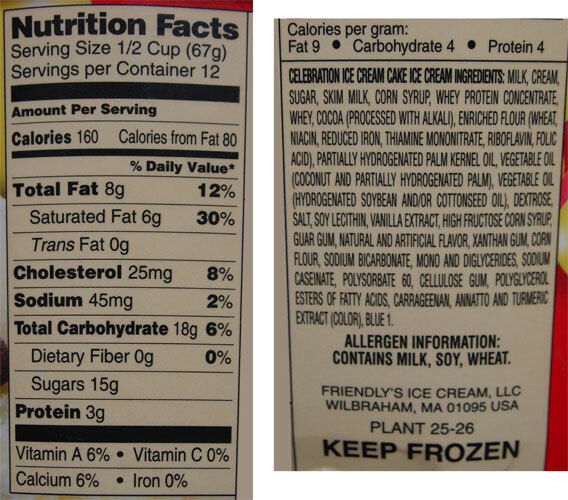 [New for 2014] I was down at Walmart trying to restock the freezer for my family when I spied one very brightly colored Friendly's container. Oh yeah, my daughter needs this one ASAP. and vanilla ice cream with chocolate covered crunchies. All I have to say is, how did no one think of this sooner? They've literally put all the ice cream cake components in to this scoopable container. It's such a simple idea but it works great. 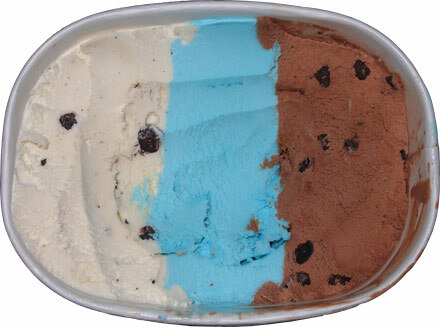 The blue middle even tastes like an ice cream cake's blue frosting (an homage more than a straight overly sweet counterpart). It's just a great party trick that the kids are going to love. Is it perfect? Well, that's for the historians to decide. The good news is that chocolate side has that distinct ice cream cake chocolate flavor (hard to describe, but you know what I mean). The "bad" news is that the while "vanilla" side tastes like it's very mild cake counterpart as well. 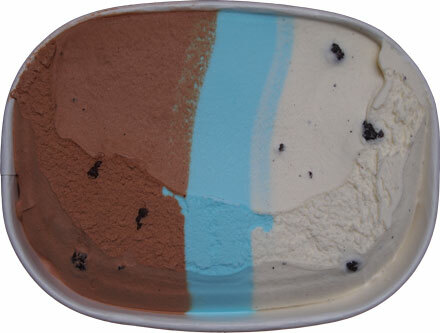 The vanilla part in ice cream cakes tends to be pretty flat (aka near flavorless) as it relies on everything else to provide flavor, though to be honest, this has never bothered me, it's personal preference really. It's not a mind blowing vanilla here, but at the same time, I was never expecting some super powered vanilla. I wanted ice cream cake and I got it. So if I seem to be talking in circles, that's because I am. 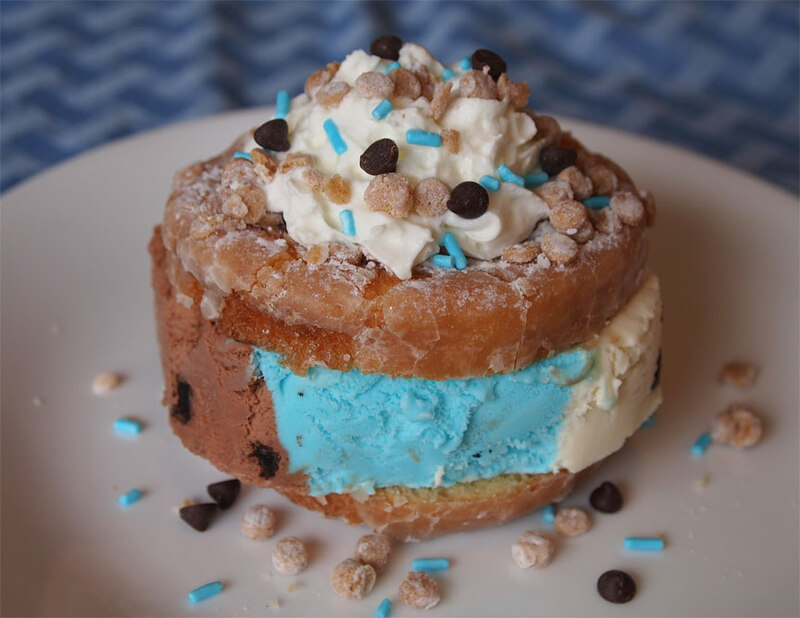 I mean how many ways can I say that this tastes just like just about every ice cream birthday cake you've ever eaten. On Second Scoop: Oh man, I went for my official second scooping but my daughter has pretty much made this one disappear all on her own. I knew she would this one! I think what really hooks me personally is the fact that the chocolate side has that same unique flavor you find in the ice cream cake. Sure, some will argue chocolate is chocolate, but it amuses me and I've always been a fan. I also seem to be running in to more crunchies so that's a bonus. Nice job on this one Friendly's! I know *exactly* what you mean about the distinct flavor of the chocolate in ice cream cake. And as me and Nick were discussing last week, ice cream cake can NOT be called that without the crunchies and fudge! I'm def gonna keep my eyes out for this one! I just got back from the store, specifically to get this based on your recommendation. Thankfully my local grocer had it. Can't wait to try it tonight! Melissa, this is their newest limited edition. It's possible they still have inventory of the older one and once that's gone, you'll be able to get your hands on this one! Holy crap this ice cream is amazing. The perfect flavor that was staring them in the face the whole time! Such a savings over buying an ice cream cake too! This is the best thing since Party Cake ice cream! Anise and Dubba, I think they started producing it again because stores that no longer had it around me just recently started stocking it again. 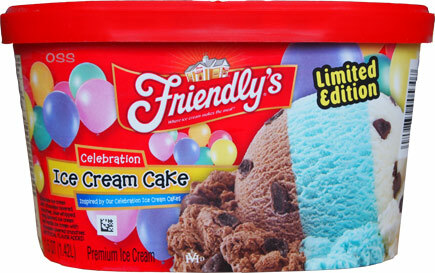 A store near me finally got Friendly's, and this was the most tempting flavor; it is still labelled as limited edition even though it's two years after the initial review. Perhaps it is just a rotational limited flavor. This was a good flavor, but I didn't love it. The vanilla was pretty bland, but that was fine because it made the awesome crunchies stand out more, whereas they got a little lost on the nice chocolate side (as Dubba said, it reminded me of an ice cream cake - and almost a bit like a Frosty, though I haven't been to Wendy's in a while - rather than normal chocolate ice cream). However, while the blue whipped icing topic was good, I quickly got tired of eating it straight on its own (yes, the vanilla and chocolate was there to combine with the frosting, but I was able to eat each of those on its own just fine without feeling like I needed to get a scoop with one of the other flavors) even though I really like frosting ice cream in general (I had a similar issue with the new Blue Bunny Blu's Birthday Party or whatever it was). Perhaps I wouldn't have gotten as bored with it if it had some sprinkles as a mix-in. I would get it again (it is nice to have 3 different flavors in one package, and it didn't all mix together despite defrosting for a while), but not at full price. As for my first experience with Friendly's in general, it was fine but not outstanding. None of the other flavors really grabbed me, and while this wasn't bad enough to make me swear off the brand, it wasn't enough to make me want to go rush out and try their version of standard flavors like Cookies and Cream or Mint Chocolate Chip. @Anon: Friendlys is having textural issues at the moment, like so many other mainstream brands, they are struggling with costs and quality and food additives and stabilizers. We're actually in a bit of Friendly's hiatus in my house as their standard stuff is just not very good right now. I hope they turn things around. @Dubba: Thanks for the info/warning. I just assumed they weren't sending the best stuff to Arizona :).